Campus has been preparing for weeks. Every last bit of wrought iron got a fresh coat of shiny black paint – gates, railings, lamp posts, and barriers. The wilting tulips were pulled and replaced with rows of bright red petunias. Fresh sod was laid, windows washed, floors were waxed. And then the final touches – stages built, tents erected, and a sea of chairs spread across Healy Lawn. Golf carts buzzed everywhere, filled with stanchions and water, boxes of programs and signage. It’s graduation time and it’s a beautiful thing. There’s a photo hung over the desk in our study. Dad and I are in the kitchen. I’m wearing a purple cap and a blue flowered dress, getting ready to get on the T and head to BU’s arena for my high school graduation. Sun is pouring through the windows. And we’re grinning, ear-to-ear, giddy with the fun of such a momentous occasion. I’ve always loved pomp and circumstance, ritual and tradition, ceremonies and moments of historical consequence. Dad did, too. I think that’s something I learned from him. I remember watching the parade of nations during the opening ceremonies at the summer Olympics in dad’s study with the air conditioner humming and the lights turned low. We watched from Afghanistan to Zimbabwe, caught up in the costumes and the stories, country after country. We reserved the same level of enthusiasm for our local ceremonies, from the Logging Day parade in Rangeley to our ritual watching of the Boston Marathon, at the corner of Foster Street and Comm Ave, as the wheelchairs and front-runners came flying down the back side of Heartbreak Hill. We watched year after year, giddy like it was the first time. But of all the inspiring pageantry I’ve witnessed, nothing compares to Harvard’s commencement ceremony. Each school marked by the color of the crows feet on the lapels of the graduates’ regalia, as they march into Harvard Yard. The future lawyers carry gavels, the educators carry books, the international policymakers process in with globes in their hands. And once everyone’s taken their seats, degrees are conferred, one school at at time, each with their own perfectly crafted phrase. Honed over decades to its most essential elements. It’s glorious inspiration. I wish dad could have seen it. Meanwhile, back in my kitchen, I’m carrying on our favorite ritual of all, the strange art and science of cooking and eating. Specialized utensils for every kitchen task, from filleting fish to pitting cherries, from hulling strawberries to zesting oranges. Prepare the protein and mise en place, sauces in bowls, pans oiled and buttered. Forks on the left, knives and spoons on the right, napkins in laps. Salad first, dessert last. What better ceremony is there than this? Today’s recipe is a tried and true favorite. Perfect for a special summer night (did I mention it’s already summer here? ), but easy enough to make for any old weekday dinner. 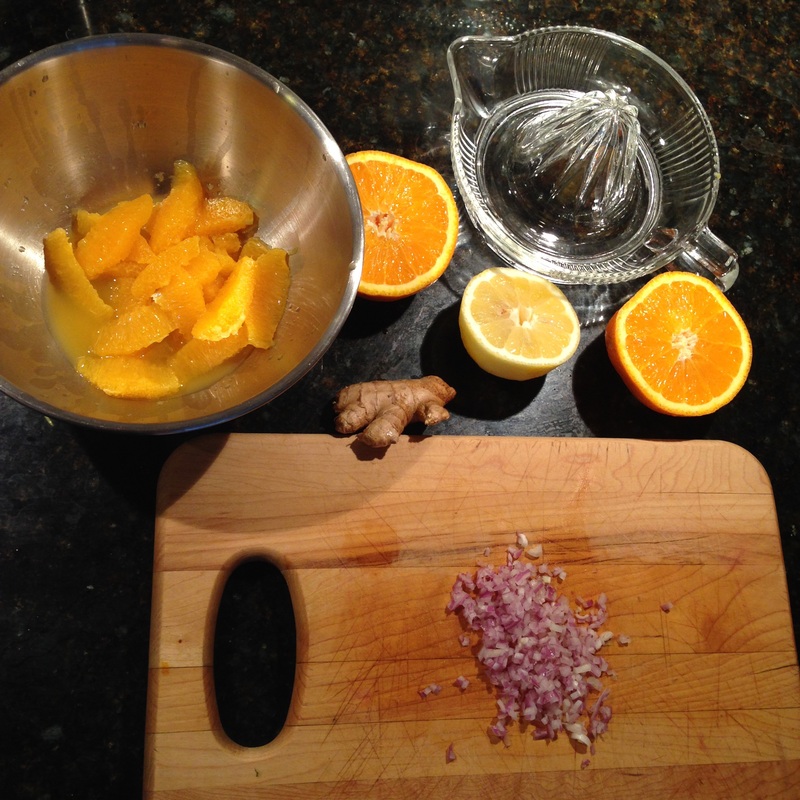 This time around, I swapped out the grapefruits for three oranges, which I highly recommend. It’s sweet and tart and a perfect compliment to the buttery salmon. And because this is a time for pomp and circumstance, you are absolutely required to garnish your salmon fillet with a feathery chiffonade of basil. Just because. 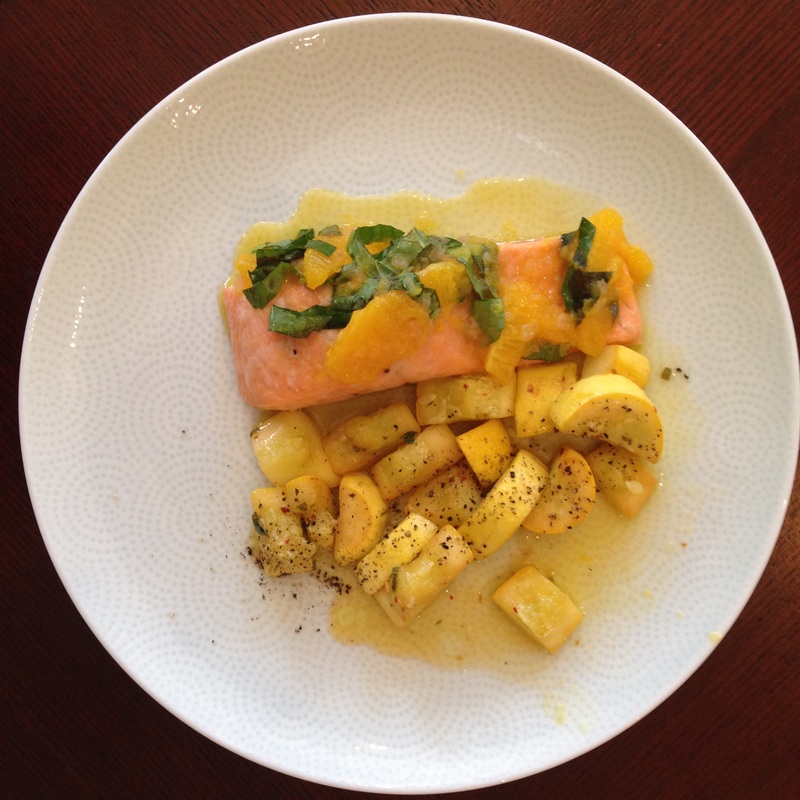 Preheat the oven to 350 degrees F.Season the salmon with 1/4 teaspoon salt, place in a baking dish and roast until cooked through, about 18 minutes.While the salmon is cooking prepare the sauce. Cut 1 of the grapefruits into sections by cutting off the top and bottom of the fruit, then standing it on 1 end, cut down the skin to remove the pith and peel. Then, with a paring knife, remove each segment of fruit from its casing and cut the segments in half. Set the segment pieces aside. Juice the other grapefruit and set the juice aside.In a medium skillet, heat the oil over a medium heat. Add the shallot and saute until softened, about 2 minutes. Add the ginger, grapefruit juice, honey, and cayenne pepper and bring to simmer. Cook until sauce is reduced by about half about, 10 minutes. Add lemon juice and season with salt, to taste. Right before serving, toss the grapefruit pieces and basil into the sauce. Put the salmon onto a serving dish. Spoon sauce over the salmon and serve.